You may have read reports that certain lakes in the UK have been affected by deadly blue-green algae. But no matter where you are in the world, if your dog likes to swim in lakes, streams or other areas of open water, or drink from these when out on walks, this article is a must-read. What is blue-green algae and why is it a problem? Blue-green algae can be found in water throughout the UK (i.e. in ponds, streams, lakes, estuaries etc.) and these can produce toxins which may be harmful to animals and humans. Dogs are most commonly exposed when swimming, playing in or drinking from contaminated water. Water that contains blue-green algae may appear a different colour, or may be recognisable from coloured algal blooms, appearing on the surface of the water, or close to the shore. Unfortunately, it is impossible to know if there are any toxins present in the water without testing. The amount of algae in a body of water may vary throughout the year. If you come across a body of water that is known to contain blue-green algae, do not let your dog swim in it or drink from it. 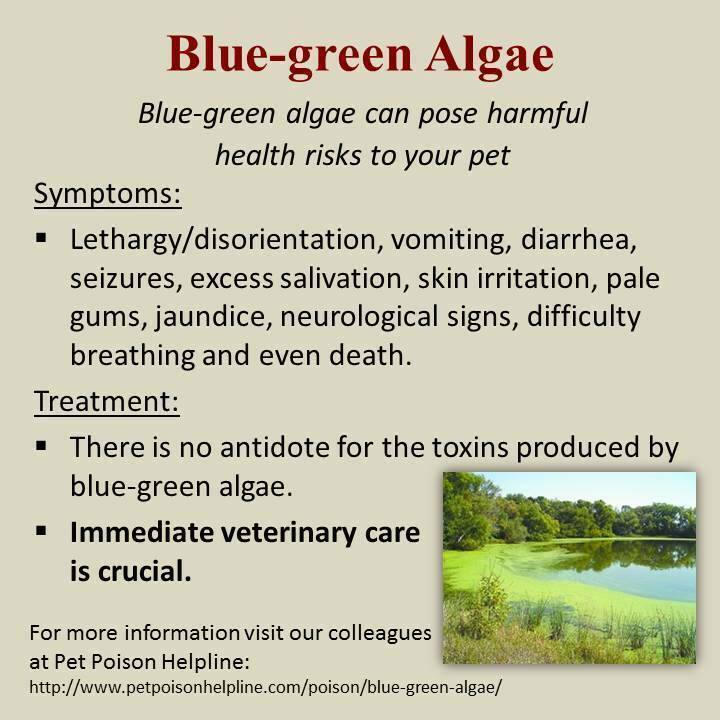 Dogs can develop poisoning from blue-green algae when they drink from such water, or lick themselves after swimming in it, and this in turn has a toxic effect on the stomach and internal organs, which may prove fatal. The type of symptoms that affected dogs can present with, and how severe they are, depends on whether the toxin is affecting the liver, or has begun to have a systemic effect on the entire nervous system. Diarrhoea, which may be bloody. Neurological changes and changes in temperament. Left untreated, both types of toxicity can soon prove fatal. If your dog has been swimming in or drinking from an outdoor water source and exhibits any of the above symptoms, you should take them to the vet as a matter of urgency. You should explain to the vet where your dog has been, and if possible, take a water sample from where your dog was for testing. Blood and urine panels can help your vet to make a definitive diagnosis, but the history of your dog’s activities and the water that they have been in are the most important tools in diagnosis. Can blue-green algae poisoning be treated? Successfully treating blue-green algae poisoning in the dog can be tough, as water is quickly absorbed by the body, and its associated toxins along with it. The faster you can get help, the better your dog’s chances of survival, and if your dog can be taken to the vet shortly after ingestion, they may be able to be given an emetic to encourage them to vomit up the water, or a product like activated charcoal to absorb as much of it as possible in the stomach. Treatment then depends on how the algae is affecting the dog, and relies upon supporting their liver and nervous system functions, while minimising pain and discomfort where possible. Blue-green algae toxicity can be difficult to treat, and often proves fatal. Even for dogs that ultimately recover, the after effects of poisoning may have repercussions for the rest of their lives. Blue-green algae in water often makes it appear very green in colour, and you may actually be able to see huge algae blooms within the water itself. However, it is not always possible to tell if water is undergoing a bloom and the associated die-off, and so just because water looks clear and clean, you should not assume that it is. Even water that your dog regularly swims in or drinks from can be affected by blooms, so you should not consider any particular body of water as safe, particularly in hot weather when water levels are low. Never let your dog swim in or drink from unknown water sources, and if your dog has been swimming outside, wash them off when they get back home. Why is it so important and how do I do it?! In puppies, the window of opportunity for the socialisation stage closes around 16 – 17 weeks of age. After this if puppies are not well socialised already may become fearful of unfamiliar people, objects and noise. This could ultimately lead to aggression through fear. Socialisation should start as soon as possible – with the breeder! This can be a delicate process, especially if the puppy has come from a quite home, or an outside kennel or barn.